"I tried so hard and got so far, but in the end, it doesn't even matter" - In the end, Linkin Park. In the end it was all about the letter of law and not of spirit. Putting an end to the entire Mumbai Mill Land saga, the SC (SC) in its decision on 7th March 2006 dismissed the earlier High Court verdict on this case. Simply put – open lands do not include lands vacant after demolition. What that means is that mill-owners get to retain their entire built-up area and have to share only the open spaces with the BMC and MHADA. A matter of interpretation: At the heart of it all was a simple point on interpretation. Did the term “open land” include “land vacant after demolition” or did it not. The High Court in its Oct-05 judgment held it did. The SC in its Mar-06 verdict has said it does not. Hence the SC judges spend considerable time and space in explaining how they’ve interpreted the law in making their conclusion. However, the SC considers this “irrelevant” (Ref Clause K re: DCR 58, where the SC states that the High Court’s judgment is “wholly unsustainable as several irrelevant factors, e.g. deluge in the city of Bombay in 2005, were taken in to consideration for the purpose of interpretation of DCR58”. Yes, indeed. What does the development of mill land area have to do with the floods this city had faced? Sure, a few more 50-70 storey towers wouldn’t really matter if another such flood were to hit the city, right? Oh, sorry, that’s not how laws are supposed to be interpreted. Yep, I won’t make a good lawyer. Impact on environment: Does DCR58 (the 2001 version) affect the environment and impact the quality of life of a Bombay Citizen and hence considered as unconstitutional? Um, no. The SC judges believe that “The environmental aspect considered in DCR58 may not be to everybody’s satisfaction but the regulation has to be interpreted…having regard to a holistic approach to a large number of problems”. Hence, DCR58 isn’t unconstitutional from the environment p.o.v. After all it was made because the earlier DCR58 (1991 version) “failed to achieve the desired objective forcing the State to take a conscious policy decision”. 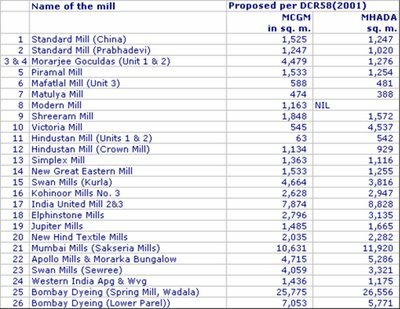 How green is my mill: Another point on questioning the constitutional validity of DCR58 (2001) was that reduction in green areas would again impact quality of the citizen’s life. The SC first questions the factual accuracy of this contention simply because “reduction” implies that the greens have to exist in the first place(Duh!). It then outlines the mill-owners argument that under DCR58(2001) more private greens would come up, since they would get more land(“three more Shivaji parks would be added”). And then goes on to say that just because the “ideal situation” could not be brought about by the State, DCR58(2001) cannot be unconstitutional. Oh by the way, did you note the “private greens” there ? – interesting concept, reminds me of the time when I was shooed off from the garden in my (richer) friends building, because, well, I didn’t stay there. 600 or 400acres: The SC lays to rest the contention that the mill land area available for development is 600 acres. It’s not. 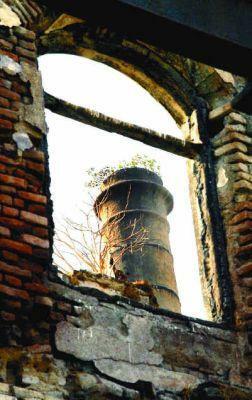 It’s 400 acres because 200 acres comprise of running textile mills not available for development. 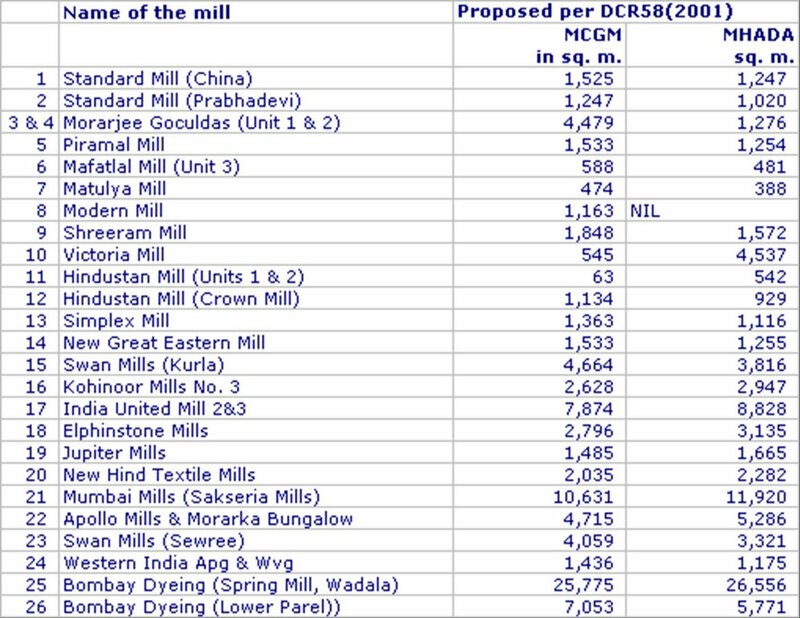 Hmm… I wonder if the owners of these mills now have any incentive of shutting them as well. After all, why make cloth when you can make money? Workers – divided we fall: It’s indeed sad that the workers could not get united for their causes. While the RMMS sided the mill-owners, the GKSS sided the BEAG. The RMMS stand – 35,000 workers stand to benefit from the VRS schemes entered into by the RMMS and the management of several mills. (a) As on date, the NTC has discharged their entire liabilities making payment to the extent of Rs398.76crores, payable to the workers. (b) The Mah. State Textile Corp (MSTC) has also cleared outstanding dues of its workers to the extent of Rs22crores. (d) However, Rs373crores remains outstanding to be paid to 20,000 workers – and this is directly linked to the development of the mill owners. How much is Rs373crores? To put things in perspective, the NTC raised Rs2,041 crores, or more than 5 times that amount by selling five mills, or one fifth of the total 25 it owns. The GKSS stand – Also refer my blog Part 4 on this. The GKSS highlighted the defaults made by the mill owners and also said that the workers dues have not been paid substantively. Moreover, the revival scheme has not been implemented and no guidelines framed for the Monitoring Committee by the State for overseeing the disbursement of funds. And of course, the fact that the workers dues are only a paltry sum of the amount received by the mill-owners for selling their land. Of course, the issue of the workers dues was outside this case. No wonder the SC said "In these appeals, we are not concerned with the said issues". What now ? The pessimist in me says that this was pretty much the last chance the city had to save itself. The optimist in me believes that more land to the private developers should mean some focus on planned and sustainable development, as against giving more land to BMC and MHADA, both infamoulsy corrupt and inefficient bodies. I'm stuck between the two. But despair is coming more easily to me now than hope.